Thus our musical tale begins - with a lost score for an early piece, and here, its première recording newly remastered by Peter Harrison. 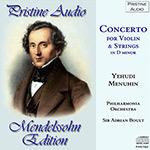 Musically it shows the huge promise Mendelssohn showed as a youth. The outer movements both show the clear influence of Mozart and Haydn in style and form, though Mendelssohn does play with the traditional structure of the recapitulation of the first movement, with no pause for a candenza and the two themes reappearing in reverse order. However it is in the middle movement, the Adagio non troppo available here to download in full by clicking on the Play button, that we start to hear the voice of Mendelssohn's lyrical mature style for perhaps the first time. By this early stage in his life his compositional talents were already being recognised by his teacher, Zelter, who the previous year had introduced him to the poet Goethe, beginning a friendship which was to last for many years and greatly affect the composer. A second visit followed in 1822, the year of this compositions; a year later Zelter wrote to Goethe: "In everything he gains, an even force and power are now hardly wanting; everything comes from within him, and the external things of the day only affect him externally. Imagine my joy, if we survive, to see the boy living in the fulfilment of all that his childhood gives promise of."